You might think that after 40 years of watching baseball I would be used to the average fan’s (or sportswriter’s) complete inability to understand basic statistics. But watching the meltdown around this year’s underachieving Red Sox is yet another reminder that not all baseball fans can do long division. 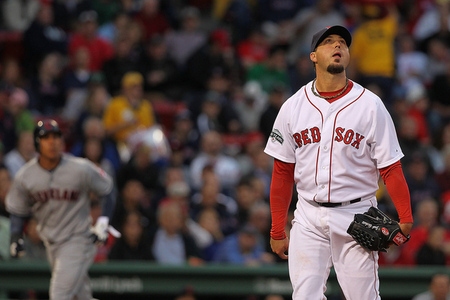 The consensus is that the Sox’ .500-ish season is the fault of the pitching staff. In the words of NESN, the Sox’ obsequious broadcasters, “It’s really only the pitching staff that hasn’t carried its weight.” Now I’m not particularly picking on NESN; it’s just an example. It is dogma that the problem with the Sox this year is pitching, particularly Josh Beckett and Jon Lester, except for a small heretical sect that blames Bobby Valentine. And the stats seem to back that up: The Sox are third in runs scored, behind Texas and the Yankees, having scored 591 runs in 121 games, or 4.9 runs/game. The pitchers have given up 554 runs or 4.6/game, sixth-worst in the majors (516 earned runs for a 4.30 ERA, still in the bottom third). The offense is fine, right? But about a millenium ago in dog years, back when Bill James (now a Red Sox staff member) was putting out Baseball Abstracts on heavy stock newsprint in cardboard covers, he suggested that the biggest problem with the Sox, historically speaking, was that generations of front office types had underestimated the effect of playing in a tiny little ballpark, so undervaluing pitchers and overvaluing hitters (particularly left-handed opposite-field doubles hitters who play wall-ball and right-handers with big uppercut swings to loft pitching wedges over the Green Monster). Come on down, Wade Boggs and Jim Rice, respectively. DVR forward thirty years, and you might think this wisdom would have trickled down a little bit. Naaaaaah. The Sox have scored 342 of their runs in 63 games at home, or 5.4 runs/game. But the park factor for Fenway this year is a whopping 1.278, meaning that teams playing there will score about one and a quarter times as many runs as the same team playing in a neutral park. A little long division (342 divided by 1.278) shows that the same team, playing at the same level but in a park that doesn’t coddle hitters and punish pitchers, would have created 268 runs, not 342. Sound like a lot? It’s the difference between that glossy 5.4 runs/game and 4.25 runs/game. The league average is 272 runs in 60 home games or 4.5 runs/game, so that means the Sox offense at home has actually been below average, once you account for the park. On the road, the offense has scored 249 runs in 58 games, a pace of 4.3 runs/game, again just behind the league average of 4.4 (although in fairness to the Sox hitters, none of their road games are in Fenway). The two closest teams in terms of production away from home are KC and Oakland. They strike out a little more than average, walk a little less (take away from their World Series teams patient hitters like Johnny Damon, Kevin Youkilis, and Manny Ramirez and add strikeout machines Jacoby Ellsbury, Will Middlebrooks, Jarrod Saltalamacchia and Cody Ross) and they still don’t run well. Without delving too deep into the math (there is a formula for adjusting for both home and road park effects, but it’s complicated), let’s say that the offense has been a little below average at best. For the pitchers, the effect is just the opposite. On the road, the team has a combined ERA of 3.80, ninth-best in the majors, but at home it’s 4.74, third worst. For comparison, Colorado has a home ERA of just over 6.00; the AL averages 3.93 at home and 4.26 on the road. Overall, the Sox pitchers have an ERA of 4.30, a little worse than the league average of 4.09, but considering more than half their games so far have been in Fenway, they’re performing as a somewhat above-average staff, despite Beckett and to a lesser extent Lester. Great read. It’s hard to win without pitching, and I think that’s been the problem for this year’s Red Sox squad.